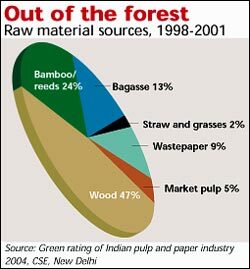 The Indian pulp and paper industry stands indicted for the wide-scale decimation of forests in the country. Till the mid-1980s industry got wood at throwaway prices from vast forest lands owned by the government. As forests were denuded in their vicinity, their footprint increased; companies went far and further to procure cheap wood as raw material. But by the mid-1980s, environmental consciousness grew and the pressure mounted against deforestation. Industry cried foul. It argued that it faced a massive raw material shortage. Since then, it has used every pressure -- and every new minister of environment and forests -- to argue that it should be given captive forest land to grow its raw material. This proposal almost made it through many times. Environmentalists stymied this idea, arguing poor people were dependent on these same remaining common lands for their subsistence needs. This debate continues till date.